Whether you only have time to pick up a quick bite to eat on the go, or can sit down for a business lunch, New Jersey is ripe with eateries focused on this mid-day meal. Enjoy a hearty sandwich or a super healthy vegan entrée to keep you powered on plants while zooming through the rest of your day. Here are our favorite lunch spots in the state. Don’t be scared away by the potentially long line at Hot Dog Tommy’s—the hot dogs are so worth the wait at this popular joint. The hot dogs served at Tommy’s are all gluten free from the brand Berks, and they come in three options: leaner wiener, all beef hot dog, and vegan dog. The plentiful toppings can be used to create your own dog, or you can order off their signature favorites. The chili cheese dog and MacCrunch dog are definitely worth tasting. As the name suggests, Ani Ramen is a ramen restaurant with six different options for ramen plus a handful of add-ins. The miso ramen makes a hearty, heart-warming lunch, yet won’t leave you overly full and sleepy for the rest of your work day. For something even lighter, try one of their three bun options, perhaps with a side dish of edamame or shishito peppers. Chick’s Deli is popular for its cheesesteak sandwiches including its unique twist on the typical hoagie: the chicken cheese steak. The fresh hoagie rolls make a solid vessel for the ample portions of meats and cheeses included in the sandwiches. In business since 1957, you can rest assured that your order will be consistently good. Peck Peck is a family-owned spot for Korean fried chicken. The menu is very small, making it easy to order, but you know you’ll get to enjoy something flavorful when your order arrives. The menu includes wings, drumsticks, chicken tenders, chicken strip bowl, and chicken tender salad. You can choose the flavor for your chicken and even order off the sides menu to make your meal larger. Rutt’s is the home of New Jersey-style deep fried hot dogs and has been open since 1928. This raved about restaurant is a perfect spot for a lightning speed lunch of “Ripper” dogs, chili, or a burger. The menu also features sandwiches, fish, and entrees, as Rutt’s is open for dinner, too. For a business lunch with plentiful healthy options, Sagami Japanese Restaurant is known to serve the best sushi and sashimi around and has been doing so since they opened in 1974. Their menu features numerous sushi rolls, soups, and boxed options for lunch. Their miso soup is definitely restorative after a rough morning at work. This super healthy eatery uses organic ingredients in their cooking, and where possible, incorporates local and fair trade goods as well. Their lunch menu will fuel you with plant-based foods, and diners can enjoy snacks, salads, and entrees. Opt for the flavorful bahn mi or a savory grilled Portobello sandwich that won’t leave you feeling overly stuffed. If a mid-afternoon pick-me-up is what you’re after, Booskerdoo café serves coffee prepared from their own freshly roasted beans and light meal options such as quiche and soup. Freshly baked scones, pies, and cakes are available as dessert to help you continue your productive day at work. And if you happen to work remotely, Booskerdoo is a great place to linger over lunch while you meet deadlines. You know you’ve found a winner when the waitresses wear pajamas as their uniform. Serving only breakfast and lunch, Shut Up and Eat serves soups, salads (that are large enough not to leave you hungry), sandwiches, dogs, and burgers. This is also a kid-friendly restaurant as they offer a toy corner, allowing busy parents to slow down enough to actually taste their food. 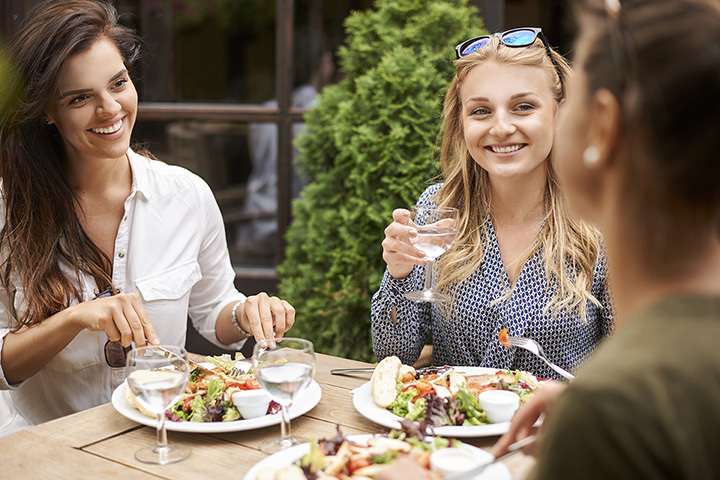 This is definitely a good one for moms enjoying a meal out with friends. A deli-style sandwich is possibly the most iconic American lunch staple. And Frank’s Deli & Restaurant definitely delivers with their sandwiches, even calling them “overstuffed” on the menu. Made either on homemade rye bread or a hard roll, dig into roast beef, pastrami, capicola, or any other typical cold cut meat and cheese you can think of. Hoagies, club sandwiches, and a few side dishes, such as French fries and potato salad, are also on the menu.